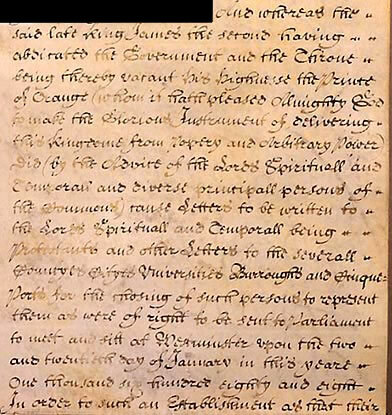 The legislative expression of the 'Glorious Revolution ', the Bill of Rights began by outlining the grievances generated during the reign of James II. It then listed important rights relating to the powers of Parliament; and declared William and Mary to be king and queen, in the hope that they would be instruments of 'deliverance' from tyranny. It also implemented new oaths of allegiance and supremacy, and stipulated that in future no 'popish prince' could 'inherit, possess, or enjoy the crown'.